This gallery consists of photographs which have been recently uploaded. They will remain in this gallery for several weeks, before they are permanently moved to their proper gallery. If you are a frequent visitor to the site, it will assist you in recognizing new additions to the site. The Berrien Historical Foundation continues to accept photographs of persons or places pertaining to the history of Berrien County, Georgia. Contact Bryan Shaw at onearmshaw@mchsi.com for more information or use the link at the bottom of this page to email your photos to berriencountyga@windstream.net. 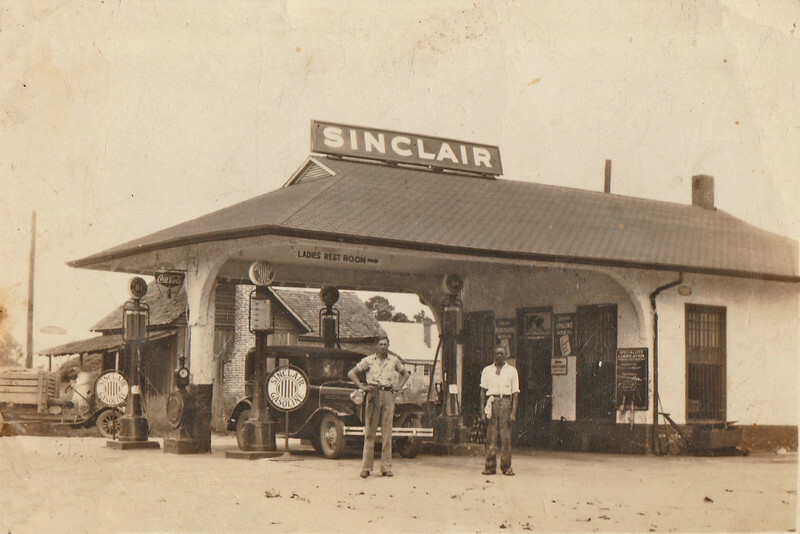 Sinclair Station on McPherson Avenue and East Dennis Street on the north east corner. Station operated by Glenn Gaskins, oldest son of Lucious B. and Lessie Parrish Gaskins. Glenn is shown on the left and unidentified employee on the right. His parents’ home can be partially seen in the center background with light colored roof. Photo courtesy of Marlene Basson. This is interesting. NE corner would have been where Suwanee Swifty Store (now Liberty???) was located. I don't remember this building ever being there in my lifetime. Any ideas on when it was torn down?